Keep probability questions as simple as you possibly can. Please. Disclaimers: 1) Probability problems are some of the SAT’s most difficult, but they’re also some of the most rare. There’s a pretty decent chance you won’t see a very hard question like this on your test, so prioritize your prep time; don’t worry too much about this stuff until you’ve really nailed the basics. Ironically, this is my most involved post to date, but it corresponds to the smallest point potential. 2) As you surely know if you’ve done probability in school, as involved as this is it really only scratches the surface of a concept that can go VERY far down the rabbit’s hole. I’m only covering the kind of stuff you might see on the SAT. If you’re looking for a more complete treatment of probability, try this. 3) I’m assuming some rudimentary knowledge of combinations here. The probability of an event is equal to the number of ways that event can occur divided by the total number of possible outcomes. So the probability that you will be chosen at random to represent your 30-person class in the hot dog eating contest is 1/30. Likewise, the probability that your frenemy Ashley will be chosen for the contest is 1/30. What if I asked you about the probability that EITHER you OR Ashley would be chosen? Well, now the event we’re concerned with happens in 2 of the 30 possible outcomes. It would be satisfied if you were picked, or if Ashley was. Therefore, the probability is 2/30, which simplifies to 1/15. When there are multiple, mutually exclusive ways an event can occur, ADD the probabilities of each way to get your overall probability. Again, this only works if you’re talking about events that are mutually exclusive. In other words, it only works if both events can’t happen at the same time. Example: if you buy lottery tickets, since only one ticket can win, every ticket adds to your probability of winning. This is important, so make sure you’re solid. Hover your mouse over the following examples to ensure this won’t leak out of your brain. What’s the probability of rolling an even number on a standard 6-sided die? 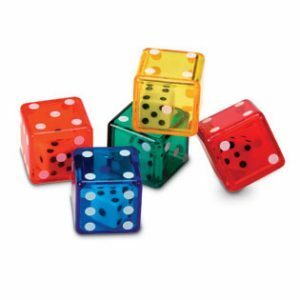 What’s the probability of rolling a number less than 6 on a standard 6-sided die? What’s the probability of rolling a prime number on a standard 6-sided die? What’s the probability of flipping a coin and getting either heads or tails? What’s the probability of flipping two coins and having one or the other (but not both) come up heads? OMG this is so easy! Well buckle up, kids. Things are about to get more interesting. Yo dawg I heard you like dice. What is the probability of flipping 4 coins and having them all come up heads? John and Sam are both choosing randomly from 5 types of candy: types A, B, C, D, and E. What is the probability of them both choosing candy type A? Names are being picked out of a hat. If there are 8 different names in the hat, what is the probability that Sven is picked first and that Gretchen is picked second? What is the probability of flipping 3 coins and having 2 of them come up heads and 1 come up tails? Mathematically, there are 3 ways to get 2 heads and one tails: HHT, HTH, THH. There are 2×2×2=8 total possible outcomes, so the answer is (B) 3/8. Note, though, that it requires some thought to come up with the possible outcomes that satisfy our condition. In the time it took you to think about possible HHT combinations, you also could have just listed the 8 possible outcomes, and counted. Phil is holding 4 cards in his hand: 8 of clubs, 5 of hearts, king of hearts, and ace of diamonds. 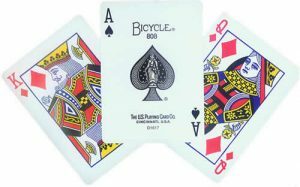 If he places them on a table in random order, what is the probability that the first and last cards will both be hearts? Straight up: it’s not easy to come up with the “math” solution. Bragging rights to whoever does so first in the comments, but I’m just going to solve it by listing possibilities. Yes, this really is the way I solve these questions when I score 2400s. Step 1: Assign numbers to the cards (give 1 and 4 to the hearts for simplicity’s sake). Step 2: List all the possibilities that start with “1” (ones with hearts on the ends bolded). Step 3: Either list all the possibilities that start with “2,” or recognize that all the possibilities that begin with “2” or “3” cannot possibly satisfy our condition of having hearts on both ends because “2” and “3” are not hearts, and skip right to listing all the possibilities that begin with 4 (again, bolding the ones with hearts on the ends). Take a minute to note the order in which I made my lists. If you practice listing things in order from smallest to greatest, you can get very fast at it, which makes a question like this a piece of cake. Start by “anchoring” the first 2 digits, and listing all the possible combinations of the last 2. Then anchor another set of 2 digits at the beginning, and repeat. In other words, list all the outcomes that start with “12” then all the ones that start with “13,” then all the ones that begin with “14.” Only move on to outcomes that begin with “2” once you’ve exhausted all the ones that begin with “1.” Again, this is really the way I do these questions when I take the test. I respect it if you want to solve them the math way every time, but I caution you that such a dogmatic adherence to math on a test that is NOT A MATH TEST increases your likelihood of making a mistake under pressure. Your call. Also try this recent Weekend Challenge question involving probability (post contains multiple explanations). Well I’m glad to know that the way I would have done it (i.e. what seems like the crazy long way) seems to be the “right” way to have done it. My question is this: How can you do that quickly enough on the SATs when you have about a minute per problem? A little practice goes a long way, there. In the kitchen table math post, there are only 8 possibilities, so it really should take 20 seconds max to list them all IF YOU’RE COMFORTABLE with probabilities. That’s actually what this whole post is about. Probability is one of the trickiest things the SAT will throw at you (thankfully, it’s also rare), but almost all probability calculations can be sidestepped quickly and efficiently by listing possibilities and counting them. The trick is for that to be your first instinct! Lots of students wrestle with calculations for a minute first, before they even think to try listing possibilities. If you just start writing possibilities as soon as you see a question like this, you can actually get through it very quickly. Ok. THANK U! 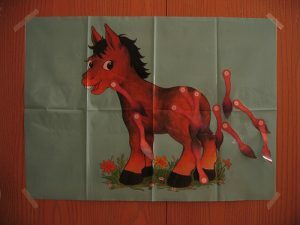 I have bookmarked the post to come back to later this evening. Off to pick up my daughter now and then running around. Actually, one of my errands is to stop off at Kumon and check out the vibe there. I had a thought last night which is that maybe I’ll do Kumon over the summer with my kids. What do you think of Kumon? If only I could spend all day doing SAT problems (what I actually want to do). Morning was blown with hours and hours of paperwork. Ah, paperwork. What a hateful task. 🙂 I have similar wishes: if only I could spend all day WRITING SAT problems. I don’t have any strong opinions about Kumon either way, but I know some people swear by it. Are you an official SAT question writer? No no no…I just impersonate one fairly well (I hope). I don’t imagine they’d be happy if their official writers had blogs like this one. 2(L + W) = 10;2(5 + w) = 10;5 + w = 5;W = 0? So how is that possible ?? You’re thinking of perimeter. Area = length TIMES width. In number 17 too I didn’t know how to solve it,because its not written how much snakes are actually inside each pit is there something wrong I interpreted or read wrong ? You don’t need to know how many snakes are there. A snake can bit more than once. So even if it’s just 1 green snake and 1 red snake, the solution is the same. If you don’t like snakes, this is basically just a coin flip problem. What is the likelihood of flipping a coin and getting heads 4 times in a row? This problem is in my book, too, so I’m going to paste part of the handwritten explanation I did there. I’m betting the problem is that you’re not counting both 2,5 and 5,2. It’s confusing, but you have to count them twice since they’re they’re twice as likely as a double (like 2,2) to come up. I keep getting the same answer too – using counting principle AND listing! Oh, I got it, I must have counted the same sums (such as 2+3 and 3+2) twice! Glad you figured it out. Let me know if you run into any other issues! The fastest thing I can think of is to first figure out the total number of outcomes (6 × 6 = 36) and then just list the outcomes that would work (2 + 3 = 5, 2 + 5 = 7, 3 + 2 = 5, 5 + 2 = 7). Don’t fret too much about shortcuts, though. It’s a hard question, so you SHOULD have to think about it a bit. First, figure out the total number of possible committees. If order mattered, we’d to 10*9*8 and call it a day, but order doesn’t matter in a committee; Suzy, John, and Sam is the same grouping as John, Suzy, and Sam. So we count the number of possibilities either using combinations, or by listing. In this case, because listing would take a while, we’ll do it the mathy way: 10C3 = 10!/(3!7!) = (10*9*8)/(3*2*1) = 120. That’s 50 different possible groupings that have 2 boys and one girl. Note that once you see how things are shaking out, you can speed the process way up, so you don’t actually have to list 50 things. Note also that of course you could still solve this with combinatorics, but you have to be super careful as you proceed. The huge mistake people make on a question like this is calculating 5*4*5 = 100 possibilities. If you do that, you’ve said that the order of the boys matters, and you’ve therefore double counted every group. What you’d really want to do is (5C2)(5C1) = (5!/(2!3!))(5!/(4!1!)) = (5*4/2)(5) = 50. The probability of a grouping of 2 boys and 1 girl from this group is 50/120, or 5/12. I’ve got sick when looked at the problem… Is it possible for the question like that to show up in a real test? Nope…not a realistic SAT question. As is true of many of the questions people ask me on here and on the Q&A, I answer them because I’m trying to be helpful, even though they might not be real SAT questions. The “math” solution to #18 (Phil’s cards) isn’t hard if you teach students to use the multiplication rule but always handle constrained positions first. Namely: Draw four blanks for the four spots the cards could occupy. There are two choices for the first spot (because the card that goes there could be either of the two hearts), but only one remaining heart and so one choice for the last spot. After you’ve used those cards and spots, there are 2 remaining choices (the club or diamond) for the second spot and only 1 card/choice left for the third spot. So there are 2*1*2*1 = 4 favorable outcomes, out of 4!=24 possible permutations, and 4/24=1/6. I don’t disagree. I like listing because it’s simple and not-too-slow, and the rare counting question on the SAT will have small enough numbers to make it manageable. When I work with people on the GRE, where the numbers are bigger, I use more general counting principles. Thanks for the kind words. I think we’re more similar than different, and I always love meeting new tutors who know their stuff. If I have to pick one problem that I think informs my tutoring decisions regarding complexity in counting, it’s the plumber problem in the Blue Book. There’s a question to which the ‘listing’ solution is very straightforward, and so is the ‘math’ solution. BUT there’s also an incorrect math solution that seems very reasonable at first glance, and of course the result of that approach is an incorrect answer choice. I’ve seen so many students (and one notable teacher) miss that question using a math approach that I decided at some point to advocate the slightly less elegant but foolproof listing approach to that kind of question. I think we should combine the 2 ways you guy mention. Under pressure, sometimes I find changing the daunting probability problem involved huge numbers (which Mike says is not often tested because SAT is calc-optional) into a simplified one so helpful. That means I use listing method first for the simple one, deduce the pattern, and be confident to apply the formal-school method for the real intimidating one. I try to balance them, and if got stuck with one, I say to myself let turn to the other. What matters here is the appropriate method one thinks himself fit perfectly and at ease to perform in real test. Also, thinking 2 ways to solve probability problems ensures that we make a right answer. Right! It’s good to be nimble and switch back and forth between methods depending on your question. There are 4 spots on the table. Write “4” in spot #1, because that’s how many cards are available at first, then “3” in spot #2, because 1 card is already on the table, then, following the pattern, “2” in spot #3 and “1” in spot #4. Multiply: 4 × 3 × 2 × 1 = 24. The mishap with the plumber question on the Khan Academy website is easily avoided with one additional easy step, as long as the solver recognizes that the “arrangement” of the 2-person trainee teams doesn’t matter. There are 2 spots, meaning 2 different ways each team COULD be arranged, so you have to divide that 12 by 2. I hate these kinds of problems :c it’s my weakness. There are different ways to arrange the letters E, F, and G in a row from left to right. How many more ways are there to arrange the letters D, E, F, and G in a row from left to right? For this problem, I got it correct (using inductive reasoning and luck) and I want to know the “mathy” way to solve it and the “not mathy” way. The non-mathy way would probably be listing, but I figured that for the question, it could be better phrased as: “How many ways are there to arrange the letters D,E, F, and G in a row from left to right?” That question and the test question are equivalent, right? Then I just did 4x3x2, which is 24. Also, isn’t it permutation since order matters? If that is the case, then isn’t it 4 P 4. I don’t get it. Yes, this is a case of 4P4 if you prefer that notation. Or if you just use the general “how many choices do I have for this spot” counting principle, you do 4 × 3 × 2 × 1 = 24. Personally, I think being able to list out the 24 possibilities of a 4P4 quickly is a useful skill for tougher questions, but you certainly don’t need to do it here. Yeah, but isn’t 4 P 4= n!/(n-r)!=4!/4-4)! how do you solve 17?? For each bite, there’s a 1/2 probability that the snake that did it will be green. If bite 1, bite 2, bite 3, and bite 4 are all from green snakes, then it’s (1/2)(1/2)(1/2)(1/2) = 1/16. Basically, I was just trying to create a problem that’s slightly more interesting than a coin flip problem. This question could have just been Corey flipping a coin and getting heads 4 times in a row. How do you solve number 19? Thanks in advance. If the area of the rectangle is 10, then the height must be 2, which means the diameter of the circle must be 2. Therefore, the radius of the circle is 1, and its area is π. Rounded to 2 decimal places, that’s 0.31. I still don’t understand #16. Why isn’t it 1/2 x 1/2 x 1/2? Why is the answer 3/8? (1/2)^3 = 1/8 is the probability of any single outcome of 3 coins being flipped, but there are 3 ways you can get two heads and one tail, so you need to multiply 1/8 by 3. Well , I think there is an easy way to do it ! I imagined that there are 4 places that need to be filled with one card at a time . have 4 possible cards for the 1st place , 3 for the second ( because I used one card of the 4 cards ) and 2 for the third and 1 to go in the last place . The product is 24 , and this represents the total number of possible outcomes with no restrictions . This gives me 2 . 5 heart l 2 l 1 l king of hearts , and this is another two . The number of possible ways to get hearts on both ends is 4 . I think the “little boxes” analogy helps sometimes . Can you please explain the fourth example from the first section of the list and how you got the answer? There’s a 100% probability of getting heads or tails because there’s a 50% probability of getting heads OR a 50% chance of getting tails. When you’re looking for the probability of whether one thing OR another is going to happen, you add the probabilities of each thing happening. Rob will spend at most t1 seconds waiting for Mily while Mily will wait no more than t2 seconds. Rob can arrive at any moment within [0..T1] with equal probability. Similarly Mily can arrive at any moment within [0..T2]. Rob asks you to calculate the probability of meeting his friend Mily in the cafe. Can anyone help me in finding the probabilty given T1,T2,t1,t2?